Over the past year I have been cooking more out of my cookbooks instead of going to the web looking for recipes. I’ve also added a few cookbooks to my small cookbook collection. I really enjoy the recipes from The Herbfarm Cookbook. It opened my eyes to may herbs and foods I had never cooked with or even had before. My favorite cookbook is Simply Classic: A New Collection of Recipes to Celebrate the Northwest. 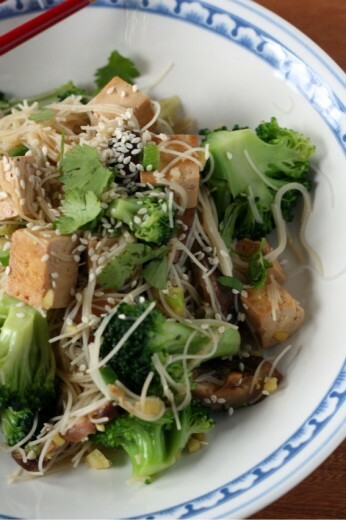 Your Stir-Fried Sesame Broccoli and Tofu with Rice Noodles is making my mouth water … will be adding this to next week’s menu plan (which I keep in my head, not on paper) :). I love that you cook and live healthy. I am a meat and potaoes girl, yet crave something like you posted here today. Your blog has opened my eyes to a whole new world and I am going go meatless once a week and going to use one of your recipes each time I do. Thanks for such a great blog and congrats to you on your 500 posts! this Guy cookbook looks like a fun cookbook for guys?! just had rice vermicelli and spring rolls for lunch (and sat outside for the first time this year) . 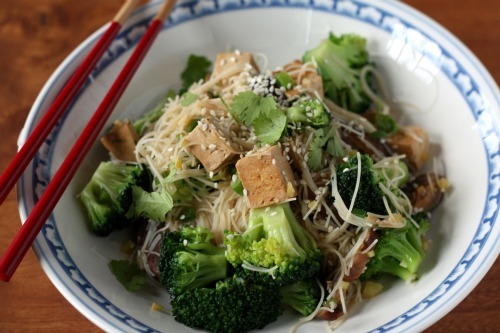 i wish i could cook vietnamese, you never miss meat with all those noodles and veggies. I think I might have tried a similar dish to the one you’ve showcased here as Deborah’s Madison’s Vegetarian Cooking for Everyone has always been one of my go-to cookbooks. I wish I could say it was The French Laundry Cookbook, but alas, like Bouchon, the vegetarian options are so few and far between in that cookbook, that it simply cannot be! My favorite cookbook right now is Cooking Light – its helped me find healthier alternatives to every day recipes, leaving me feeling empowered over my kitchen! Love it! I have really enjoyed your blog recently. I found it about a month ago. I became a vegetarian about 9 months ago and was in a food rut. I have enjoyed reading it and some recipes from it. My current favorite cook-book is Quick-Fix Vegetarian. As a mom with young kids, fast and healthy is a winner in my book. Guy is not really my thing either, but my brother is getting married in two months, he is a chef and loves Guy, so the book for him would be nice. Thanks for the great blog! I’m all about balance that errs on the healthy side (to make room for dessert), but I’d still love to check this book out! My favorite cookbook? Probably Dorie’s Baking book! Thanks for not giving in to sponsor pressure. Even though I love giveaways, there comes a point where a blog has so many giveaways that they don’t seem genuine anymore. Question: Do you watch cooking or food-related tv shows? If so, which ones? I am not a vegetarian but I eat a LOT of vegetables. I try to get my husband and son to eat them – I am sometimes successful. I wish I could take one of your classes! My favorite cookbook is my Fannie Farmer’s cookbook. It’s old but it has my Aunt’s scribbling throughout the recipes and it is a great way to remember her! A classic that never fails me is my copy of Fannie Farmer. She is a special lady in my kitchen. My go to cookbook is a classic…Betty Crocker cookbook. Dana ~ I feel the exact same way after vacationing (especially visiting family on the East coast), that all I want/need is a big salad…. and a micro brew to boot! I dig your site sooooo much….words cannot explain! Keep up the awesomely delish recipes and witty commentary! As for my favourite cookbook: NOURISHING TRADITIONS by Sally Fallon. It is annotated with A LOT of information on nutrition and history, plus it has a funny/scary guess the food item where she lists the ingredients to processed foods and you guess what “food” it actually is. My favorite offers are definitely the ones where people tell me that they’re going to give me the “OPPORTUNITY” to promote their blog. Ha. How lucky. Nope, I would much rather have your fantabulous tofu dish than anything Guy Fieri has ever made. LOVE. My favorite cookbook is an old Land O Lakes cookbook. The food is good and the pictures are gorgeous. A cookbook has to have good pictures! I have to say my favorite cookbooks are my Rebar Modern Food Cookbook (recipes and stories from the Victoria BC restaurant Rebar) and my Windjammer Cooking. Vastly different to be sure. And like a commenter on your 500 post, I would love to know what meals you make your boys (as I’m always looking for new things to try my boy with). Dana- don’t pick me to win that cookbook! I had a chuckle when I read you were giving it away b/c I was thinking even your readers are unlikely to think that’s a good fit. We all come here to be nourished (and periodically treated) by you! as for favourite cookbook- I’m going to have to say Bonnie Stern’s Heart Smart. I have a question: have you ever done any microwave-only cooking, or do you have any microwave recipes? I’m living somewhere right now without a stovetop OR oven, so a microwave is all I have! I want to eat quality, delicious, healthy food but am limited to this cooking method. Any suggestions? Also, thanks for the cookbook giveaway! My cookbook favorites change all the time. Right now it is Wayne Gisslen Professional Baking. My daughters boyfriend is a chef and he gave me his classroom book on baking. I am learning to back what I like to call the “Alton Brown Way” by weighing everything out. When he comes to visit we enjoy cooking/baking together. I’ve learned so much from him. I’m a little creeped out that the publisher somehow found your address after you said no to the cookbook? This sounds so good and I hope you write about your Napa trip! Even if the food options were lacking I’m sure the wine was not! I am not a huge Guy fan, but my 21 year old son is moving into an apartment at college this fall, and he loves to cook…and not the healthiest stuff! I figure he will come around to better food as he grows up. My fave cookbook changes like the wind, but right now I am all over The Produce Bible so I can find some new veggie recipes with all the cool stuff arriving at the Farmer’s Market! I stumbled across your blog quite by accident a few weeks ago, and have been addicted to reading it ever since. I will, however, admit an unhealthy addiction to Food Network. Including Guy Fieri. And Michael Smith. Michael Smith is definitely my favourite – I love his commitment to homestyle cooking – as well as support for local growers and producers (and knowing quite a few farmers’ children at this point in my life, that’s a biggie). Unlike most FN chefs, Michael’s stuff is things I can actually see happening in my family’s kitchen. So, favourite cookbook? “Best of Chef at Home” by Michael Smith. In fact, I’m making his Indian Dal and Rice for dinner tonight for my family. (I love being home from university and having a kitchen again, :)) A completely meatless dish – and not a single family member will notice, either. Would love to win this cookbook! But I also like your recipes too! Some veges intimidate me — ie how to actually prep them to make them work for a recipe…. Thanks and congrats on your anniversary! My fav….the joy of cooking! Your comments were interesting. I work in PR as my day job and while I have never had to pitch to a blogger, I have done some research on it for a case study I wrote. The most important rule when pitching to a blogger was become familiar with the person you are pitching to – read their blog, know their audience, etc. This person OBVIOUSLY did not do their homework and not suprisingly, it backfired. my favourite cookbook is ‘Barefoot Contessa at home’ – LOVE IT. I was wondering if you ever cook any Indian food? I love Indian food and it is something I would like to learn how to cook, as well as Thai food…Yum! I get most of my recipes online but I do have a few cook books that I really like, and at the top of that list is Vegetarian Sandwiches, by Paulette Mitchell. It seems like I’m always in the mood for some type of sandwich and this book has some yummy ones in it. 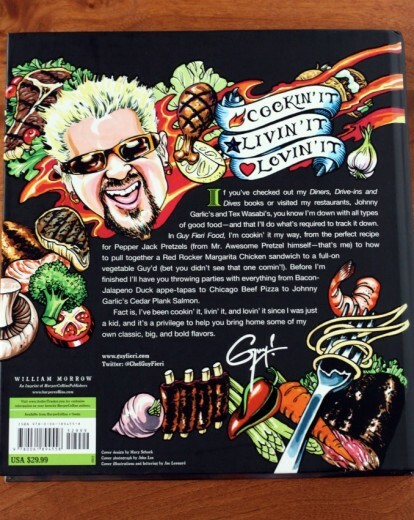 I wouldn’t get much use out of the Guy cookbook, but I would give it to my friend Gary…he love’s watching Guy’s shows and he loves to cook so I know he would enjoy it! It’s a tie between Plenty, For the Love of Salad, and Five Ingredient Fix right now :) I suggest them all! My favorite is How To Cook Everything Vegetarian. I love that all the recipes are plain enough that, while wonderful on their own, really give you an opportunity to play around and make the recipe your own. 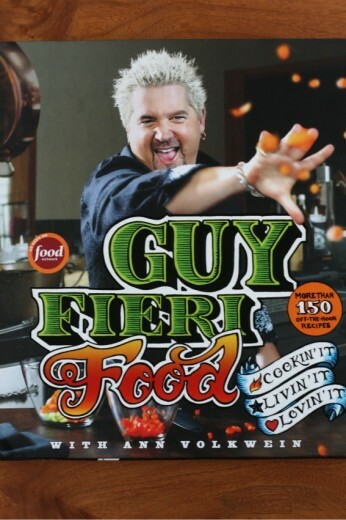 I am not a Guy fan either… something about him and his cooking just doesn’t interest me at all. I have a question (and I am sorry if you already answered this in your FAQ… I will go re-read it after I hit submit) but how long have you been a vegetarian? When/how did you decide to become a vegetarian? By the way, your cooking/blog reminds me a lot of 101cookbooks… and perhaps you should publish your own cookbook someday? :) hint hint. While I am rambling… thank you for the Seattle food suggestions recently via email. I am actually flying home from Seattle to San Jose as I type this. Sadly, we didn’t end up at any of the places you suggested (there is always next time) but we did have a lovely dinner at Cafe Bastille in Ballard. y current favorite cookbook is the Baked Explorations book, I cannot get enough butter, sugar, and chocolate! My all-time, favorite, battered-from-use cookbook is hands-down Crazy Plates by Greta & Janet Podleski. Awesome recipes, healthy and make my whole family happy! I love your website and look forward to your new posts. What type of yeast do you use for your baked goods that require it. I have had some bad luck with yeast lately. thanks! oh woman i can’t say my fav cookbook in one answer! if i had to though for some cookbook contest, then i’d go with my Baked Boys. Baked cookbook rocks: modern baking at it’s best. I used to work summers in the islands and would have purchased that book for its name alone, but I love almost each and every recipe in it and have expanded the waistlines of many a friend, family member, and coworker with those recipes! Please tell me you made it to Ubuntu in Napa…. You would love that place. Love your take on Guy’s book. Although I don’t eat the way he does, I love his enthusiasm & ideas. Would love a copy of this book – great giveaway. 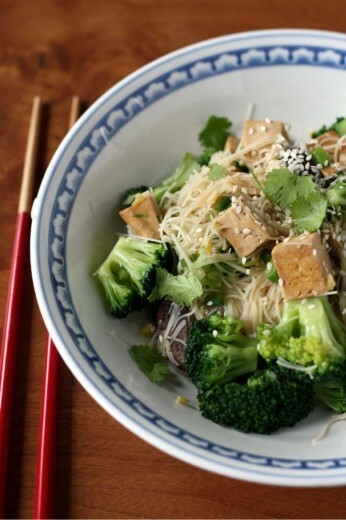 Your stir fry looks awesome! My favorite cookbook is “Mad Hungry, Feeding Men and boys” it’s fabulous, with lots of vegetarian dishes and non-vegetarian dishes. Me and my 4 boys love it! I have a few cookbooks, but haven’t opened one up in ages since the many food blogs out there! Does a baking cookbook count? If so, I would say, Vegan Cookies Invade Your Cookie Jar: 100 Dairy-Free Recipes for Everyone’s Favorite Treats. I have checked this one out from the library numerous times since I have had issues with dairy. Love her cupcake book as well. I should just go out and purchase it! What spice is your “go to” when you need that extra “umph” in your dishes?